You may have realized that my most recent posts have been almost all vegan. These marinated tofu fresh spring rolls with peanut sauce are totally vegan and totally delicious.Â This year I’ve discovered so much about myself, and as the academic year of 2012-2013 comes to a close (let’s face it, as a student, January doesn’t make a new year, September does), and veganism is one of the things I have to add to my list of realizations. So here’s the first realization: Being Vietnamese is a huge part of who I am. Even though I was born and raised in Canada, I was raised in a very small community within a small town. My weekends were filled with family gatherings, and family to the Vietnamese people is the first priority. Family is everything. You have nothing without family. But she’s helped me grow, and helped me learn so much about myself. So thank you mom, thank you for teaching me what it means to be Vietnamese, and teaching me how to make all these delicious foods. She taught me how to make bÃ¡nh cuá»‘n, nÆ°á»›c máº¯m, canh chua, these fresh spring rolls, and so many more things, and they’re always delicious and remind me of home. So, that’s the first thing I learned. I will forever be stuck in the identity crisis of whether or not I’m more Canadian or more Vietnamese, but this year I have really learned how much I value the Vietnamese in me. Furthermore aside from eggs, Vietnamese diets and food (the vegetarian food anyway) is almost all vegan, so that’s the other thing I’ve learned about myself. I’ve learned that I really do believe in the vegan lifestyle and ethics. It’s better for the environment, the world, the economy (especially if I buy more local veg), and my health (has anyone been scared by Fukushima radiation realities yet??). However, I have a huge problem letting go of dairy and eggs. I’m going to limit my consumption of those almost completely, but I have a feeling that I’m going to have a problem with fried eggs, eggs benedict, swiss cheese, and ice cream. To make myself feel better about these decisions, I’m going to buy free-range eggs, and just limit my dairy intake haha. Besides, my body is not a happy camper whenever I have dairy so I have that incentive anyway. Maybe by December I’ll be able to let those go completely and just go vegan, but baby steps. Lastly, the thing I learned about myself is that I have a true passion for food, food writing, and food photography. I truly believe that’s what I want to do with my life, and maybe things will change later down the road, but I definitely believe that at this moment in time, taking my blog to the next level is truly how I want to move forward in this new academic year. As a result, I’ll be taking creative writing classes at the University of Toronto and specializing in food writing. To make the tofu, cut the drained tofu and put into a bowl. Whisk the dark soy sauce, sugar, chili flakes, garlic powder, salt, and a drizzle of olive oil together. Pour over tofu and let marinate for up to 1 hour. In a lightly oiled pan, pan-fry the tofu until heated through, turning so that the tofu is cooked evenly. To assemble, dip the rice paper into a bowl of warm/hot water to moisten. Place on a plate, it'll soften as you put in the ingredients. Arrange lettuce, rice noodles, cooked marinated tofu, chive, mint leaves, cilantro, and cucumber and wrap, tucking in the sides then rolling up to make a sealed spring roll. To make the peanut sauce, whisk the peanut butter, hoisin sauce, sriracha sauce and water together. Add water if you like it thinner. Garnish with crushed peanuts if that suits your fancy. Best served immediately with the peanut sauce. 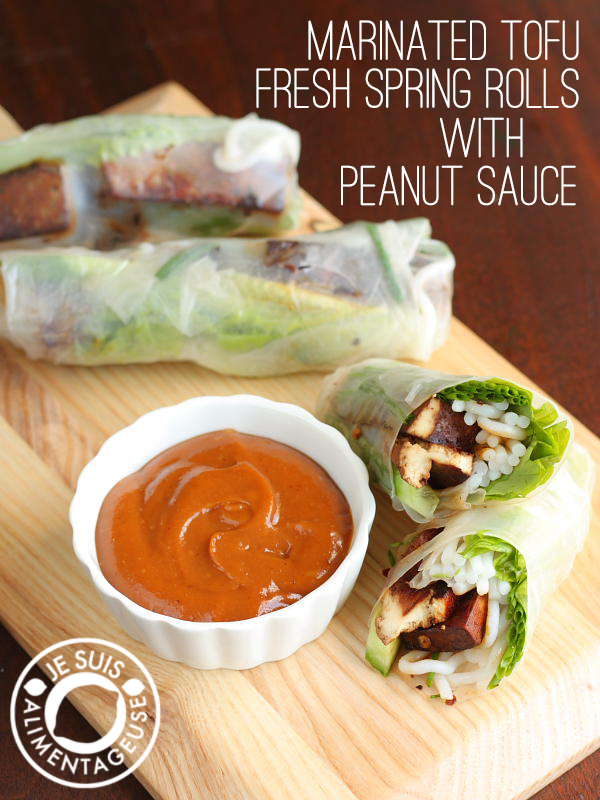 To pack as a lunch or for a picnic, roll each spring roll individually in plastic film. Best served that day. Do not refrigerate or else the rice paper will lose moisture and become gross and chewy. I loved these spring rolls! I bought peanut dressing, which I mistook as sauce and it tasted awful...I think I'll hand it to my fellow asian neighbor, and hopefully borrow some hoisin sauce from her. I thought I needed rice wine vinegar...but that's for a stir-fry recipe. I bought soy sauce, I have both peanut butter and sriracha...urgh I need this sauce! Oh no! I've never tried peanut dressing before. Hoisin sauce has always been in my fridge because I grew up eating it in soup. I hope you get it somehow! Peanut sauce is the bomb. Enjoy! If you're making them specifically for GF friends, make sure you use a gluten-free soy sauce and hoisin sauce because they traditionally are made with wheat ingredients. Can I keep the tofu ready a day before the party? I have to at least make 30 of them so will be easy. Fantastic, and yes, peanut sauce is the bomb. Love the mint and all of the textures in this one - very tasty. Heartwarming thoughts about your mom and family too. How many spring rolls does this recipe make?